for giving Winston a home. Each year that I've donated a dog, it was wearing a hat which determined the dog's ultimate character. First there was Gourmutt who wore a bakers hat and apron; he was followed in 2015 by Spot, with a big red nose and dressed as a clown. The 2016 Boss Dog has his teeth locked onto a stogie and he's attired in a bowler, high collar, vest, tie and wearing a monocle. I spruced him up with a natty silk boutonniere which can be changed to suit the mood. My FB followers have christened him Winston. 'Art Fur Animals', sponsored by Friends of the Cleveland Kennel, is an annual live and silent art auction benefiting animals in need at Cleveland Kennel. 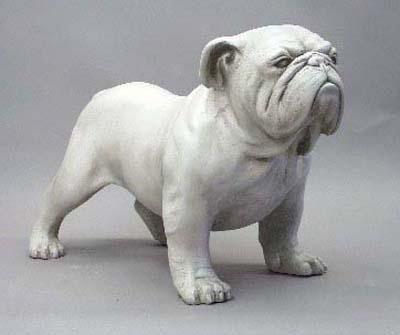 - Live auction of custom-designed ceramic dogs by dozens of renowned Cleveland artists. - Local, diverse pieces of work from photography, to paint to sculpture and more! The live & silent art auction has featured individual works of art from locally and nationally recognized artists. - Auction preview starting at 6p.m. - Chance to win amazing raffle baskets valued at over $150! Video of all the dogs. Video at the Masonic Auditorium. Art Fur Animals live auction. Pics to the left. Commissions available for this and other breeds. If you aren't the winning bidder, this dog can be customized in the likeness of your dog and to suit your personal taste. Price on request. Inquiries.